What is a "Complete Astrology Reading" and What Does It Involve? This is one of the most valuable astrology readings available, in the sense that it explains the bigger picture of your life and connects you to your personal story. Your Complete Astrology Reading covers your back-story (past life), your current karma (why things are the way they are), and Dharma (most fulfilling life purpose). Understanding your Dharma provides the perfect opportunity to neutralize the unconscious momentum of your karma and reveal what your highest life path might look like. Within the depth of information that a Complete Astrology Reading offers, I also provide a look at the intuitive and psychic gifts that you have been born with. Each of us has both free will and unique psychic gifts. I help you understand how your gifts function, so you can start using them and trusting them. Your past life story is a powerful part of your reading. This isn't a story of random "events," or past accomplishments. This story is much more profound and magical than an "astrological-event log." Your back story offers deep insight into your current life. Using a special gift, I'm able to see (clairvoyantly) a specific past life or back-story, which has shaped both your karma and Dharma in this life. What happened to you in previous lives is really quite useless information, unless it explains the "why" of your current life. Knowing the "why" of your past and current circumstances, and knowing why you naturally react in certain subconscious ways, offers deep insight into how you can move forward in your personal quest for self mastery. In-person astrology readings are by appointment at my Home Office: 8406 6th Ave NW Seattle, WA 98117. If you prefer a distance reading by phone, check the "by phone" box when scheduling. Typical long distance charges may apply. My work is detailed and exacting. My preparation time is 2-3 hrs for each reading, so I do not offer same day appointments. Your reading will be approximately 1hr 45m in length. Please allow 2 hours in your schedule for transition time. You will receive a high quality digital recording of your reading, as well as a printed copy of your natal birth chart. The cost for a Complete Astrology Reading is $250. Follow-up readings, if desired, are $150. Cash or check is preferred. You may pay at the time of your reading. 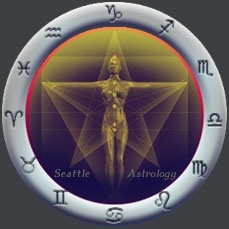 If you choose to pay by credit card, please pay in advance through the Seattle Astrology Online Scheduling Application. Payment plans are available in unique situations. Please inquire.